Summary: On the morning that changes everything, Aruna Ahmed Jones walks out of her ground-floor Victorian apartment in London wearing only jeans and a t-shirt, carrying nothing more substantial than a handbag, and keeps on walking. Leaving behind the handsome Dr. Patrick Jones, her husband of less than a year, Aruna heads to Heathrow, where she boards a plane bound for Singapore and her old life. 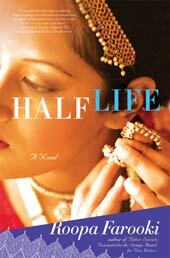 Educated and beautiful, Aruna has a desperate need to risk it all. But why? Waiting for her is a messy past and a perfect past lover she had once abandoned without even saying goodbye – a story left unfinished – until now. I was extremely excited to see that HALF LIFE by Roopa Farooki was included on the EW's 18 Books We Can't Wait to Read This Summer. I have heard some wonderful things about the author's debut novel BITTER SWEETS -- in fact, she was nominated for the Orange Award for New Writers; and I was so looking forward to reading this novel about a young woman who drops everything and returns to her childhood homeland. I really have to say that I thoroughly enjoyed this touching novel. I'm not sure why I was so surprised by this novel (and I'm pretty sure that I'm not going to be able to express my feelings in this review), but I couldn't put this book down. It was a relatively short novel (only about 250 pages) but it was engrossing and it packed a very powerful punch for me. I quickly became caught up in the characters' lives and was desperate to find out how everything connected. When I read the first chapter, I kind of thought this novel would be about a confused woman who needed some time to discover herself -- not really chick-lit per se, but smart woman's fiction. And this novel certainly was about Aruna and her state-of-mind; however, I found this book to be so much more than that. HALF LIFE wasn't a light read for me, but rather one that involved me in the characters' stories and touched me deeply. I absolutely love that this novel took me by surprise, made me pause and gave me a great deal to think about. While I did enjoy the story in HALF LIFE, I think the real beauty of the novel was in the character development. While Aruna was a very complex and flawed character, I loved how the author portrayed her. Once I got to know her and understand her past, my heart really went out to her. But I also thought her childhood friend/boyfriend Jazz and his father Hassan were extremely well developed as well. I thought Ms. Farooki did a great job showing the many layers that existed in each of the characters as well as their complicated feelings for each other. I was extremely impressed with Ms. Farooki's writing style. In fact, I loved the way she told this story. The novel was told in third person narrative, yet each chapter alternated between the three main characters -- Aruna, Jazz and Hassan. I thought this presentation was extremely effective, and I actually liked seeing the characters and their actions through an "outsider's view." I also enjoyed how well the author moved back and forth between the present and the past -- it was seamless. In addition, I thought Ms. Farooki's storytelling abilities were wonderful and I love how the characters evolved and their secrets unfolded. HALF LIFE would be a terrific pick for book clubs, especially during the summer months since it is a pretty short read. There is reading guide available which delves into some of the same things I thought about while reading this novel. Some of the topics for discussion include the meaning of home, family dynamics, love, loss, cultural issues, mental illness, sacrifice, and friendship. I highly recommend HALF LIFE! And if you are considering reading it this summer, then you should also check out my latest challenge -- the 2010 Entertainment Weekly Summer Books Challenge! You know, this was not my list for your EW reading challenge, but your review has made me rethink that decision. I had dismissed this as lighter than I normally like, but I see now that there is more to the novel. I love books set in other cultures and with its fabulous characters and great plot, this sounds right up my alley. Fantastic review! Wow, can you imagine just walking out of your house and totally leaving? I really want to read this! I really, really enjoyed this one. I'm so glad you told me about it via Twitter or it would have taken me a lot longer to get to it. Excellent review. This is waiting for me at the library. Yeah!